WE WOULD LOVE FOR YOU TO COME AND STAY WITH US! 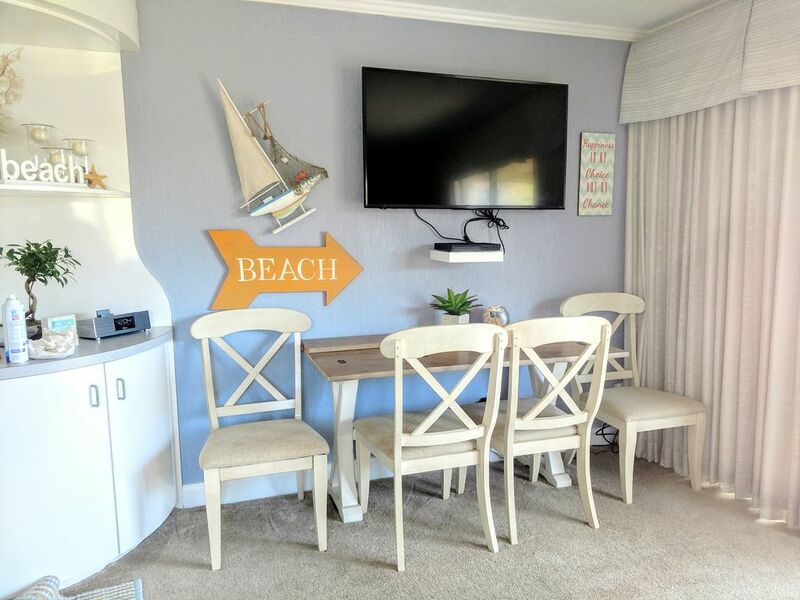 **WE HAVE BEEN RENTING AT BEACH & TENNIS FOR YEARS, WE KNOW JUST HOW TO MAKE YOUR STAY SPECIAL!! **WE DO NOT CHARGE CLEANING LIKE MOST OTHER OWNERS!! OUR CONDOS ARE PERFECTLY CLEANED FOR TOUR ARRIVAL!! **WE NOTIFY YOU ON THE DAY OF CHECK-IN WHEN CONDO IS CLEAN AND READY FOR YOUR ARRIVAL SO THAT YOU CAN GET IN EARLY AND GET SETTLED!! *coffeemaker that brews k-cups or regular, we even have a percolator for those who still enjoy your coffee brewed this way. On our balcony, we have a bar height table & chairs so that you can see the Atlantic ocean. What a great way to start the day........grab a cup of coffee and relax as you watch the beautiful sky at sunrise. PLEASE CHECK MY OTHER LISTINGS #677448, #677450, #715831, #1291363 #1128300 & 1242037, #1324775 & #1329238....THESE CONDOS ARE ALL ONE BEDROOMS THAT ARE WELL-MAINTAINED AND CLEAN!! WE ARE AT THE RESORT ON A DAILY BASIS AND ARE ALWAYS AVAILABLE FOR YOU. WEEK HAD NOT BEEN RESERVED. WE HAVE OWNED OUR CONDO SINCE 1991 AND ENJOY MEETING NEW GUESTS. WE WELCOME THE RETURN OF REPEAT GUESTS AND LOOK FORWARD TO MEETING NEW GUESTS EVERY YEAR. THE BEAUTY OF HILTON HEAD ISLAND IS THE REASON THAT WE DECIDED TO MAKE Hilton Head Island OUR HOME. The location of Hilton Head Beach & Tennis is north central on the island and is my favorite spot on the island. *The resort has 24/7 gated security *Ten lighted tennis courts, free just need to reserve *The largest swimming pool on the island *Kiddie pool next to largest *Jamaica Joe'z beach bar by pool (seasonal) *Pool next to Admirals Row *On-site bike rentals *Bicycle racks throughout property so you can lock your bike up. You can bring your own as well *Coconutz Sportz Bar with pool tables I believe that Folly Field beach is the greatest on the island....hope to see you.......ON THE BEACH! Just over the bridge to Hilton Head Island is Bluffton, SC. It is a neat, quaint historic town. They have neat little stores and Bluffton is also known as a Stat of Mind!! Fitness Center located in the pro shop at the resort. Beautiful view of the Atlantic Ocean, sitting on balcony with coffee or drink.....very relaxing!! There is a laundry room down the hall. It is operated with smart card. Smart card can be purchased at large building on the left as you enter resort. Our hamper has wheels. There are towels provided upon arrival, there are laundry machines down the hall. Small fitness center located by the tennis courts. There is a toaster as well as a sandwich press. There is DVD player in living room. There are books should you feel like reading, if you do not finish you can take it home with you. The resort has on site bike rentals near the security gate. Also, there are bike racks located near the villa if you choose to bring your own! Plenty of water fun activities on the island from dinner cruises to jet ski's to parasailing! There are plenty (over 40) of golf courses to choose from on the island and over the bridge in Blufffton. Port Royal Golf is located one mile from the resort and has here fabulous courses. THE HILTON HEAD ISLAND BEACH & TENNIS RESORT IS A 55 ACRE OCEANFRONT RESORT WITH SEPARATE CONDOMINIUM BUILDINGS. EACH CONDO IS UNIT IS OWNED AND MAINTAINED INDIVIDUALLY AND THEREFORE NOT ALIKE. THE SIZE IS THE ONLY THING THEY HAVE IN COMMON. THERE HAVE BEEN A NUMBER OF OWNERS THAT HAVE UPGRADED. WHILE OTHERS HAVE NOT. SO KEEP THIS IN MIND WHEN YOU ARE CHOOSING YOUR VACATION STAY. YOU CAN COMPARE PRICES HOWEVER IF YOU GET A CHEAPER PRICE, IT MAY BE BECAUSE THE UNIT IS NOT DIRECT OCEANFRONT OR HASN'T HAD A TOTAL UPGRADE. WE OFFER A TOTALLY REMODELED, SUPER CLEAN, DIRECT OCEANFRONT WITH QUALITY BEDDING & UPGRADES. THANK YOU FOR LOOKING AT OUR PAGE AND WE HOPE TO SEE ON THE BEACH!! We spent 4 days in Hilton Head at this lovely condo. It was perfect for two of us - cozy, stocked with more than the usual supplies, and very clean. The small patio was perfect for two, with comfortable chairs and a beautiful view. We enjoyed so many of the extras Dee had provided, including the nice snack basket of goodies! Dee was very accommodating and communications were quick and helpful. Thank you Dee for providing such a comfy and cozy condo for our stay! Loved our unit. Just my husband and I, plenty of space. The grounds were wonderful. We enjoyed ourselves. Very nice and clean! Enjoyed the many personal touches. Great condo with a wonderful view. Would stay here again! Thanks for choosing and staying with us! Clean and fun place to stay. We enjoyed Hilton Head and the condo. Great view and close walk to beach. We were able to rent bikes right there on the resort and play plenty of tennis. Loved this place!. Little touches of a snack food basket, chalk board with suggestions and coupons, and any beach item to use if you forgot anything. The condo was decorated very nice and the view from the balcony was wonderful. Clean, pretty and comfortable. Would love to visit again. We were so happy with our vacation here! They have pretty much everything you need provided and were so nice when booking. We had a welcome basket full of goodies when we arrived. Also, for the July 4th week it was not over crowded like I expected. It was a walk to the beach but we have 2 small kids so any walk is long! The oceanfront view is great! Since there are only limited oceanfront condos we still had one of the shortest walks. Pool is super large with plenty of room. I would definitely book this condo again. Perfect size for our family with 2 small kids. Hilton Head Island had many diverse shops and restaurants. Whether you are looking for a burger or 5 star dining you can find it on HHI. Holidays are not included in prices, please inquire for holiday rates.